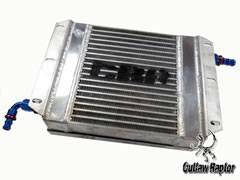 Alpha 1 Innovations “R.D.T.” (Raptor Development Team) has developed a solution to the high transmission temperatures Ford Raptor owners have been experiencing when using their trucks off road. The optimum running temperature ranges from 210-220 degrees for the 6R80 transmission. Most Raptor owners who’ve used their trucks for long periods of time off road have been reporting temperatures hitting between 230-270 degrees+. Ford Motors uses Mercon LV transmission fluid in the Raptor. Transmissions starts to break down at 270 degrees+. R.D.T. turned to their racing background and designed an efficient way to keep your transmission from overheating or even failing. R.D.T. started with a CBR Cooler that would do the job as well as not occupy much real estate under the hood. 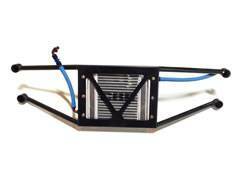 The CBR race cooler integrates the shroud for extra durability and cooling efficiency. The integrated 9” SPAL Fan provides ample airflow and also pushes air into the factory radiator. 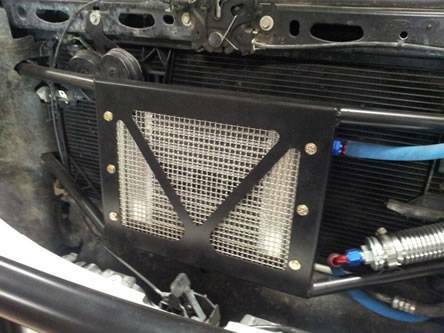 The CBR cooler and SPAL fan are mounted with a fabricated support which attaches to the factory core support behind the grill "NOT TO THE BUMPER" bumper mounted coolers will fail with any skid plate ot bumper impact. The mount installes with no drilling required. The purpose of mounting the cooler and fan this way allows the Raptor to take impacts to the front bumper without damaging anything. To allow fluid to get to the cooler, the OE lines are cut and new -8 AN push locks are inserted into the OE lines. All the necessary AN fittings and hoses are supplied (see picture). The cooler is then wired up to one of your auxiliary switches. The newly installed cooler will increase the capacity of ATF and allow an extra 3.5 quarts of fluid in the system. Mercon LV from FORD Motor-Craft is recommended as the only fluid to use. The total install time for this cooler is approximately 1hr or less. Please note the ATF fluid is not included. -8 lines for faster flow. Core mounted behind grill. NOT BUMPER. Front impact safe.